We stayed for four weeks in January 2014. Our experience was mainly positive. It started upon arrival when we saw the bougainvilla paint the outside wall in purple flowers. The walled garden housed a variety of birds such as various types of doves, the splendid sunbird and the beautiful sunbird and two types of flycatchers. We even spotted a Klaas' Cuckoo and a woodpecker here once. The rooms were spacious, the beds aren't perfect but no worse than an average hotel. We also enjoyed the spacious terrace, where we spent most of our time relaxing and had breakfast and dinner. Although the strip is just a short walk or taxi drive away, we opted to cook our own food and very much enjoyed visiting the local shops and market for bread, vegetables and other necessities. It's Africa and power outage is to be expected. Fortunately, the Yellow Apartments has its own generator. While it does work, it makes a lot of noise, which can be a inconvenience if you occupy the unit next to it. Also, it helps to make Lamin aware of any issues that may arise. The local caretaker hardly speaks any English. One call to Lamin, however, and problems will be solved on short notice. We very much enjoyed our stay and will be happy to return in the future. Myself and a party of 5 stayed in the lassida villa in brusubi for new year, the Villa was located in a lovely area with locals surrounding us who looked out for us at every opportunity just like "good neighbours" the villa was so spacious the bedrooms all air conditioned and with ceiling fans, the only thing that was missing was a mirror to dry your hair, the kitchen was well equiped and spacious with everything you could need, the lounge area was large and comfortable Lamin had even put in a single bed as not everyone wanted to share and there was still plenty of room for all, outside area was relaxing and very private well enclosed where you could lock the gates and enjoy the peace if you chose to, everyone thoroughly enjoyed the holiday and we would not hesitate to rebook the Villa and plan to do this in the future, any problems we had or questions either before our stay with sheikh or while we were there with Lamin were sorted out quickly and efficiently at any time of the day, it was a taxi ride to senegambia strip from the main turntable that cost about 100D (£2) and would be quite a walk if you were attempting it, there was plenty of shops close by for provisions and a few bars and resturaunts close at hand within 15 minutes walk, we did get lost a couple of times but locals were at hand to guide us in the right direction with a smile. Overall a fantastic holiday in a lovely villa carnt wait to return. 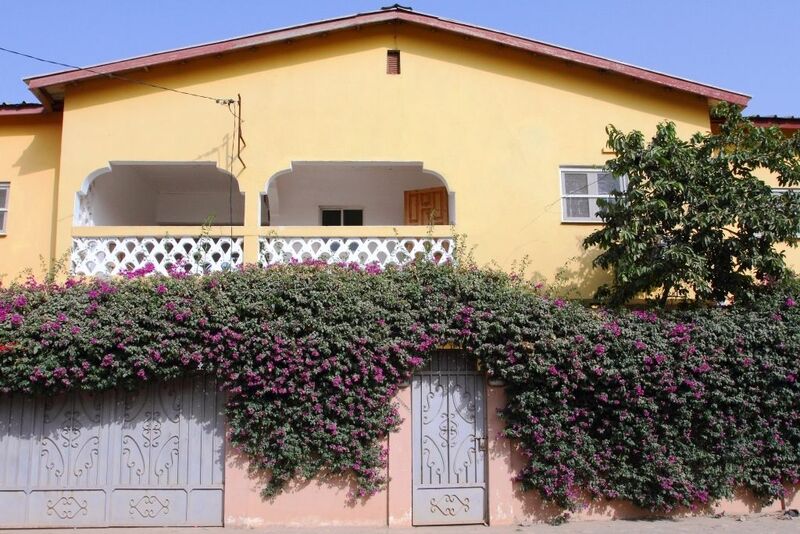 excellent place to stay with the family..
Sanchaba Yellow apartments was a brilliant place to stay, first of all the location was great, very local with a local market for supplies just 5 minutes walk, the beach and senegambia are just ten minutes by foot. Abdull the night watch man/ ground keeper is FANTASTIC, he really goes the extra mile with guests helping every way possible. We took our three young children who were also kept entertained a lot by the staff they loved the place and cant wait to return again. The rooms were all kept very clean and the washing machine and iron etc that is stated is present. electricity was on the meter so pre payment needed but is always available even during the power cuts due to the generator. We found the whole place very accommodating to our needs and will definitely recommend this place to our friends and family and look forward to our return to the apartments in the winter. I have stayed in the gambia many times in the last 12 years, many different places but these apartments have to be the best. I stayed there for 13 nights this month (April 2012) and enjoyed every relaxing minute. Lamin the manager is brilliant, no problem too small and whatever it was he sorted it immediately after just 1 phone call. The apartment was large with 3 double bedrooms, 2 bathrooms, 1 en-suite with hot water, a large living area with dining table and a decent kitchen with most things that you would need, i asked for a toaster and iron and both were supplied straight away. Abdul the watchman was also fantastic, very friendly and helpful, the cleaning lady came everyday with clean towels and bedding was changed regularly. Unlike the hotels, friends were welcome and not asked to leave at any time. I would definately recommend these apartments to family and friends and will be staying there on my next visit. Red Suite with three bedrooms and two bathrooms fitted well to our needs. and transportations for that special morning. In addition, the parents of the bride were travelling to the Africa for their first time. That is way I spent a lot of time looking for a nice and affordable accommodation, away from the tourist area, to ensure that we would have a good experience and lovely memories. And I definitely found what I was looking for! In Sanchaba Yellow Apartments we had a clean apartment with a spacious living room, no problems at all with the electricity, beautilful garden to take wedding pictures - and the most helpful staff! transportation (local vans) from Sanchaba market to Dippa Kunda and Serrekunda market. There is also a van to Senegambia, but the main road in Sanchaba was under construction during our stay. We used to walk to Senegambia, it took about 20 minutes, and if it was late we took a taxi from Senegambia back to the apartment. It is good to ask from the taxi driver whether they know Sanchaba, otherwise you might need to give them directions. One of the reasons why I chose the Yellow Apartments was that the owner was responding promptly to my e-mails, answered all my questions and called me several times before our arrival. Lamin, the local manager, was also friendly and extremely helpful. He arranged our airport transportation and constantly made sure that we had everything we needed. All of us enjoyed our stay and would be happy to return in the future!